Fig. 1: Cartoon image of a comet carrying life to an unsuspecting planet. One of the best parts of reading astronomy journal articles is stumbling across research that sounds like science fiction but is being studied rigorously and scientifically. 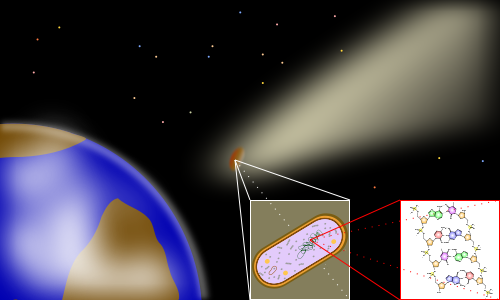 This excellently-titled article presents some recent research on panspermia. Panspermia is often defined as the hypothesis that life exists everywhere in the universe and spreads between planets, moons, and even solar systems, but the authors confine their definition solely to the idea that life can spread within a solar system, not necessarily that it has spread. 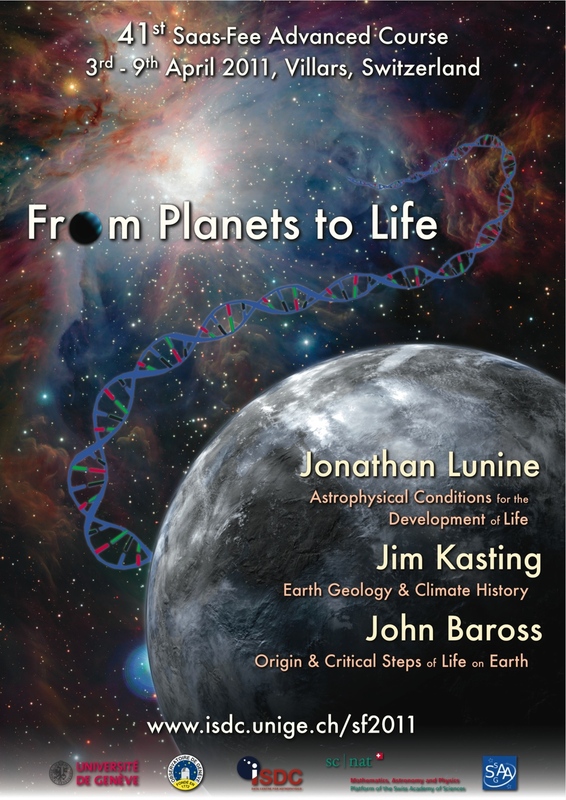 The authors specifically focus on lithopanspermia, in which microorganisms are carried between planets on rock debris that has been ejected from a planet’s surface by a meteoroid impact. They wanted to explore the possibility that life on Earth or Mars could have been carried to the moons of Jupiter or Saturn via ejected rock. The first step is to determine how much ejected material from Earth or Mars would actually reach the gas giants’ moons. The authors simulate a large number of meteoroids ejected from Earth and Mars with random velocities, then track each meteor with an N-body integrator (a type of program that calculates orbits). A large number of these meteoroids fall into the Sun or exit the Solar System without hitting anything, but a small fraction hit one of the planets. The authors keep track of how many meteoroids hit each planet, and how long it takes the meteors to reach their final destination. Fig. 2 below shows the histograms of the percentage of total meteoroids that hit each planet vs. the time it takes them to get there. For example, the upper-left histogram shows that more and more meteoroids from the Earth fall into the Sun as time passes, while the Earth to Venus histogram shows that fewer and fewer meteoroids from Earth end up on Venus as time passes. Note that the authors did not include the moons of Jupiter and Saturn directly in these simulations. The physics of the Jupiter and Saturn systems get complicated when you include the moons, which slows down the N-body integrator. Instead, the authors simulated the Jupiter+Io+Europa+Ganymede+Callisto and Saturn+Titan+Enceladus systems separately by throwing meteoroids randomly into the systems and calculated the ratio of moon impacts to planet impacts. Then they multiplied this ratio times the total number of impacts and Jupiter and Saturn to find the total number of impacts on each moon. The authors found that over 3.5 billion years (roughly the time that we know life has existed on Earth), each of the six moons should have received between 1 and 10 meteoroid impacts from Earth and Mars. This means that it is statistically possible that meteoroids carried life from Earth or Mars to one or more of the moons of Jupiter and Saturn. However, there are still a lot of open questions: Can life survive the journey between planets? Can life survive on any of the moons? What is the likelihood that life managed to hitch a ride on any meteoroids? Has Mars ever had any life that could be sent out on meteoroids? From this research, the authors can only conclude that we can’t rule out the possibility that life from Earth (or Mars) has ended up on a moon of Saturn or Jupiter. This means that if we ever detect life on one of these moons, we have to consider that possibility that it came from Earth (or Mars) rather than evolving there on its own. Fig. 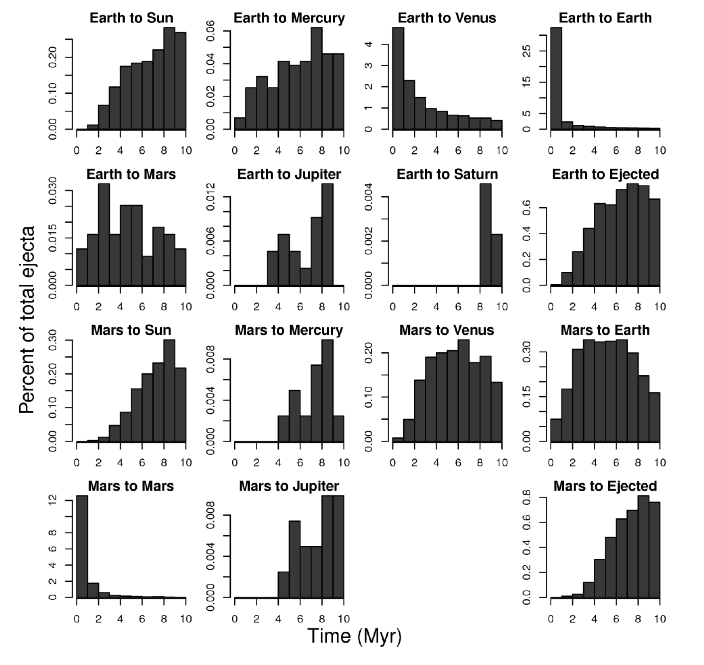 2: Histograms showing the percentage of the total meteoroids ejected from Earth or Mars vs. time for each possible final destination in the simulation. There’s no histogram for Mars to Saturn because no Mars-to-Saturn impacts were observed in this simulation. I wonder if it’s worth looking at a 2 step process, where earth material is first blasted to the moon, then an asteroid hits the moon and happens to eject some of this earth stuff on to Saturn or Jupiter’s moons. I realize the second step would have a much smaller probability, but this might be balanced by the higher probability of getting stuff to the moon, then from the moon to other places in the solar system, due to the much smaller gravity well.